Our long-established 3 star hotel in the heart of Catania city centre offers guests to this vibrant and exciting town a comfortable and hassle free stay at great value for money rates. Everyone's feeling the pinch these days, so try southern Italy instead! Click here to check out current special offers! Offering a warm welcome with a special touch of courtesy and service, this friendly yet professional Catania 3 star hotel gives you the ideal base from which to enjoy the historical centre. Take a look at our Virtual Tour for a thorough experience of the Hotel Agathae from the comfort of your own home. As for prices and availability, we’re sure you’ll find our rates as good value as any other Catania hotel, yet the grandeur of this liberty-style hotel and great central location makes for a particularly special deal. Click here to visit the Agathae Hotel Live Bookings page and check prices and availability for your dates of travel and special discounts for 3 day stays or more. The Agathae Hotel, named after Saint Agatha, the Patron Saint of Catania, was finally rebuilt at the beginning of the last century after much of the city had been destroyed 100 years previously by a devastating earthquake. Our high vaulted ceilings, tasteful yet not intrusive interior design along with a collection of Sicilian artisan-made furniture all makes for a combination that is both pleasing to the eye and practical. Family-run, the Hotel Agathae offers spacious rooms of various sizes to accommodate all types of groups. 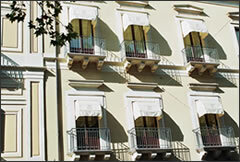 Each room tends to have its own fine distinctions that allow the hotel its individuality. Down at the front desk our hospitable staff will be on hand to offer assistance and answer queries at all times. We offer a fine complimentary Italian breakfast in our elegant and stylish breakfast room with large terrace attached. The weather here is usually warm enough all year round to enjoy breakfast on the terrace.